A man was taken into custody after police say he opened fire on a dog that had bitten a mother and daughter minutes earlier. Police say the ordeal began shortly before 6 p.m. Tuesday when a 60-year-old woman and her 31-year-old daughter were walking to their home on the 200 block of Lockart Lane. As they were walking they were suddenly attacked by one of two dogs that had escaped from a home on the same block. Police say the dog, which they believe is a Mastiff, bit both women in their lower backs. Medics and firefighters were called to the scene and the two women were taken to Holy Redeemer Hospital where they are both in stable condition. Animal Control and Philadelphia Police officers then arrived at the scene shortly after. As police began to investigate, a 67-year-old man who also lived on the block took out a revolver and fired at least two shots at the dogs, investigators said. The officers ordered the man to drop his weapon and he was taken into custody. "The two dog bite victims were already transported from the scene," said Philadelphia Police Chief Inspector Scott Small. "It's not like he was firing the shots to protect these two women who had already been bitten." Officers took the two dogs to Animal Control headquarters. 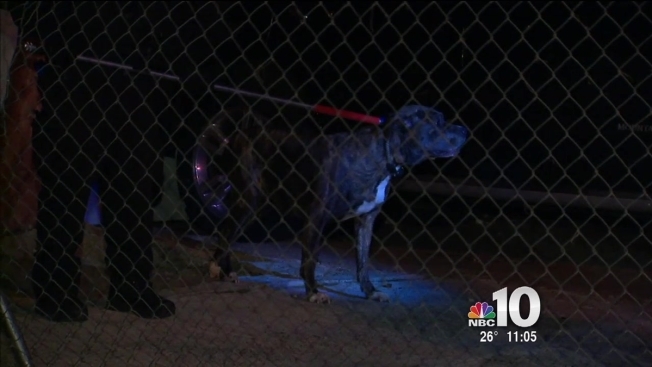 Neither of the dogs were struck or injured in the shooting, police said. Officials are trying to determine which of the two dogs bit the women and if any of them are suffering from an illness. While the 67-year-old man is in custody, police have not yet determined whether or not he’ll face any charges. Maria Kaplun, who was visiting her husband’s parents on the block at the time of the incident, told NBC10 at least one of the dogs charged at the man before he opened fire at them. Police also say that based on preliminary information, they believe the man who shot at them was attacked by the dogs in the past. Kaplun says the dogs have attacked other people in the neighborhood as well. She also claimed the dogs’ owners were at a nearby sushi restaurant Tuesday when the dogs escaped from the home.